We were delighted to be named Employer of the Year at Ashton Sixth Form College’s annual Higher Education Evening of Celebration. 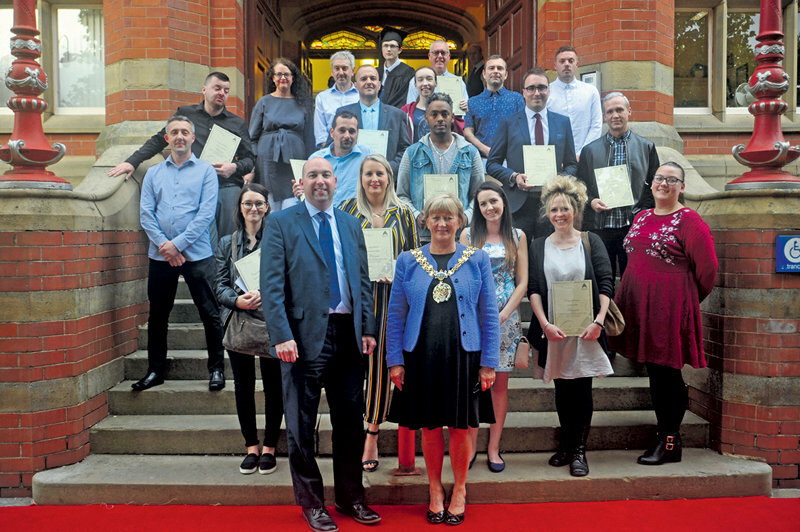 Our Principal Emma Merva received the award from the college’s Principal Anton McGrath and the Mayor of Tameside Councillor Denise Ward at a celebration evening held in Dukinfield Town hall. Throughout the 2017/18 academic year, our school has provided placements for two PGCE students from Ashton Sixth Form College. We have also hosted learning experience days for trainee primary school teachers, and our Principal has delivered lectures and keynote speeches for the college’s teacher training cohort. The Employer of the Year award recognises the support our team has given to the student teachers, who have now completed their courses and look forward to commencing their teaching careers in September – one of them taking up a post with Eden Girls’ Leadership Academy.